SAGE is an international leading publisher of key journals and groundbreaking textbooks in economics and development studies. Known for our quality content and depth of coverage, we publish current and highly topical content that disseminates the latest research, expert analysis and economic forecasts. Bookmark this page and visit us again as we highlight the latest research in our journals and profile new textbooks. 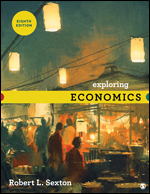 The Eighth Edition of Exploring Economics captures the excitement of learning economics for the first time through a lively and encouraging narrative that connects economics to the world in a way that is familiar to students. Author Robert L. Sexton draws on over 25 years of teaching experience to capture students’ attention, focusing on core concepts and expertly weaving in examples from current events and popular culture to make even classic economic principles modern and relatable. The text sticks to the basics and applies a thoughtful learning design, segmenting its presentation into brief, visually appealing, self-contained sections that are easier for students to digest and retain compared to sprawling text. 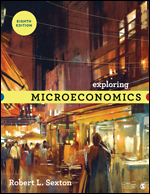 The Eighth Edition of Exploring Microeconomics captures the excitement of learning microeconomics for the first time through a lively and encouraging narrative that connects microeconomics to the world in a way that is familiar to students. Author Robert L. Sexton draws on over 25 years of teaching experience to capture students’ attention, focusing on core concepts and expertly weaving in examples from current events and popular culture to make even classic economic principles modern and relatable. The text sticks to the basics and applies a thoughtful learning design, segmenting its presentation into brief, visually appealing, self-contained sections that are easier for students to digest and retain compared to sprawling text. 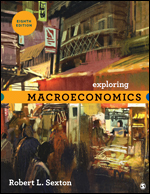 The Eighth Edition of Exploring Macroeconomics captures the excitement of learning macroeconomics for the first time through a lively and encouraging narrative that connects macroeconomics to the world in a way that is familiar to students. Author Robert L. Sexton draws on over 25 years of teaching experience to capture students’ attention, focusing on core concepts and expertly weaving in examples from current events and popular culture to make even classic economic principles modern and relatable. The text sticks to the basics and applies a thoughtful learning design, segmenting its presentation into brief, visually appealing, self-contained sections that are easier for students to digest and retain compared to sprawling text. The Journal of Developing Societies is a refereed international journal on development and social change not only in 'developing' countries but also the 'developed' societies of the world. It provides an interdisciplinary forum for the publication of theoretical perspectives, research findings, case studies, policy analyses and normative critiques on the issues, problems and policies of both mainstream and alternative approaches to development.